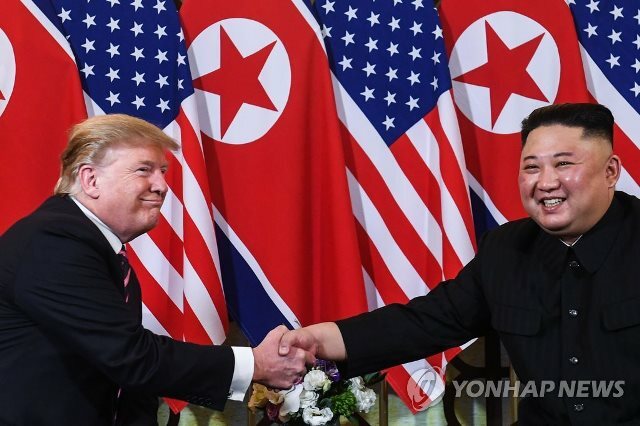 North Korean leader Kim Jong-un and U.S. President Donald Trump met in Hanoi for their second summit on Wednesday, shaking hands and pledging to deliver successful results in what many expect to be a tense showdown over how to end Pyongyang’s nuclear program. Sitting together with Trump in front of media at a hotel here shortly after their handshake, Kim said he was “confident” that they can achieve great results that everyone welcomes and praised Trump for his “courageous decision” to make their summit possible. Kim said he had to exercise more patience than ever to realize the summit. 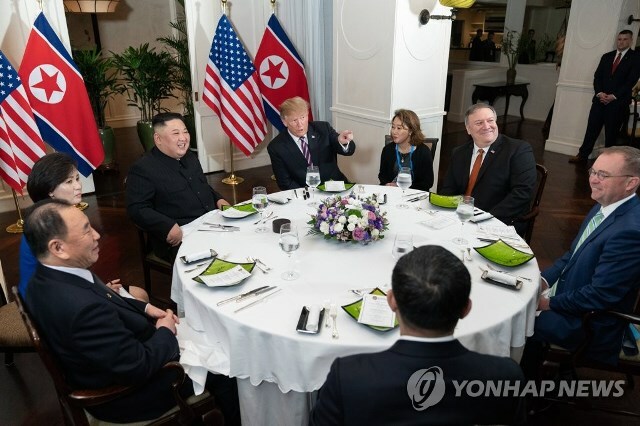 Speaking through his translator at the Sofitel Legend Metropole Hanoi, Kim also said he would do his best to produce a “great outcome” in his first talks with Trump in eight months. He added their personal relationship was the biggest progress they had made and told Kim that North Korea has tremendous economic potential. “I look forward to watching it happen,” he said. Following the photo-op, they had a one-one-one meeting with the help of their respective translators. It was followed by a small social dinner involving some of their top aides. Two American officials — Secretary of State Mike Pompeo and acting chief of staff Mick Mulvaney — joined the dinner meeting. Kim Yong-chol, a senior Workers’ Party official, and Foreign Minister Ri Yong-ho were at the dining table as well. 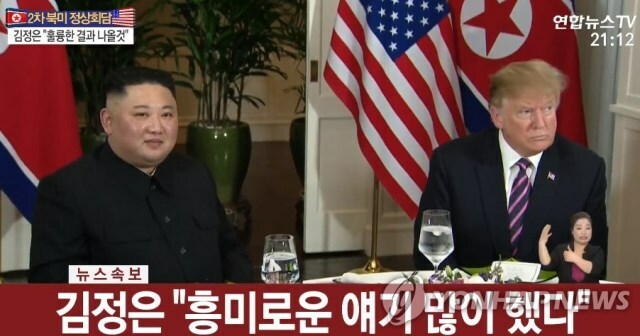 As the first minutes of the dinner were broadcast, Kim was seen laughing and saying he was having an interesting dialogue with Trump. The seemingly amicable mood contrasted with when they met each other in Singapore. They looked notably tense and nervous at the time, becoming the first sitting leaders of the Korean War foes to meet face-to-face. Their Hanoi talks come amid a sense of urgency over implementing the Sentosa accord in which they agreed to work together on “complete denuclearization,” new Pyongyang-Washington relations and a peace regime. Progress has been quite slow, however, amid disputes over concrete give-and-take steps to achieve these shared goals. Skepticism about Trump’s “top-down” approach toward the communist regime has grown in the wake of a stall in follow-up measures. Trump, seeking re-election, has faced heavy criticism at home, though he has played this down as pointless political attacks. He has repeatedly said he is happy with “no nuclear and missile testing” by Pyongyang. The world is paying attention to the content of their new joint statement to be issued after their talks on Thursday. Answering a reporter’s question separately, Trump said he hasn’t backtracked on a pledge to denuclearize North Korea, according to pool reports. Many expect such an end-of war declaration to be a meaningful first step toward replacing the armistice that finished the war with a peace treaty. Kim wants a declaration on ending the war, and he’s likely to offer the shutdown of the Yongbyon nuclear complex, arguably the heart of his regime’s nuclear weapons development, in return. Another sticking point is Kim’s call for sanctions relief. Trump is well aware of his desire and continues to talk about the communist nation’s “tremendous economic potential” if denuclearization happens. If Washington eases some sanctions on Pyongyang, it would help promote inter-Korean economic cooperation, including the reopening of the Kaesong industrial zone and the resumption of a joint tour program to Mount Kumgang. The choice of the summit host country, Vietnam, is significant in that regard, given its rapid economic growth through its Doi Moi reforms and market opening. “Vietnam is thriving like few places on earth. North Korea would be the same, and very quickly, if it would denuclearize,” Trump tweeted earlier in the day. In a meeting with Vietnamese President Nguyen Phu Trong, Trump also said the Southeast Asian nation could be a good example for North Korea.